This is a pretty bad slip up by Google. The Google Maps and Local team seemed to have sent out a batch of updates on how well a business's Google Maps listings are doing, but to the wrong businesses. 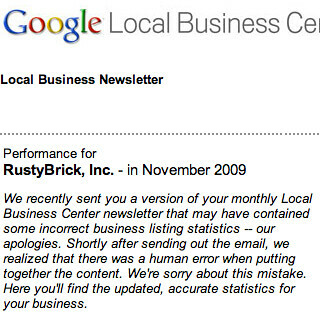 Last night, just before 10pm (EST), I received an email from Google about how well my local business listing is doing in Google. The issue was, it was not for my business! It was for a place called Polk Mechanical based in Texas. That is exactly 1,576 miles away from my business's location and would take me a full day to drive to, according to Google Maps. I am not the only one who saw this. There is a report of it in Google Maps Help forum, David Dalka got one, so did Mike Blumenthal and Danya Henninger. I emailed Google about this and I hope to get an understanding of why this happened. The data shared by Google here is not all that sensitive, but it is still data. 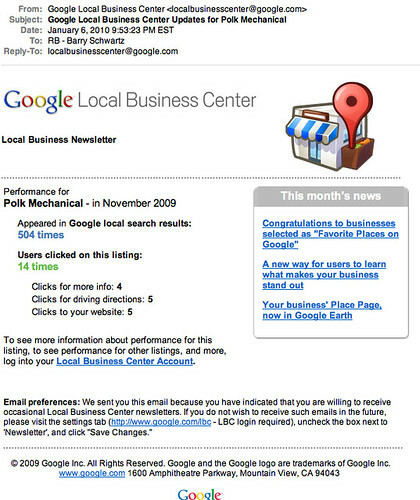 As you're aware, we send a monthly newsletter to our Local Business Center users, featuring product news and a glimpse at the Dashboard statistics which show the traffic Google properties drive to their listing. Shortly after sending the newsletter to a small portion of our users last night, we discovered that some emails included incorrect business listing information. We promptly stopped sending any further emails and investigated the cause, which we found to be a human error while pulling together the newsletter content. We'd like to sincerely apologize to all the business owners impacted and assure all our users that we're working hard to ensure that nothing similar will happen again.